What do you think about the idea of airboarding down a slope at 60 to 80 miles an hour without much to do about stopping? That is what many people are saying and why many adults are scared to try the sport, but younger kids seem to like it. Hitting the slopes isn’t like your local neighborhood hill though, at least with that you only go a certain speed. On a large slope you keep going and going untill you stop with your feet or hope for a nice, soft snow drift to back you up. Surely once airboards are developed more and more they will come out with more advanced ways to stop and what not. I don’t know if I’d call this an extreme sport yet, but it could definitely get there. Injury rate is supposed to be a lot lower then snowboarding but I don’t know if that will be completely true. According to an airboarding website, a snowboarder stated that he is sure there are going to be a lot of head to knee collisions if airboarders share the same slopes as skiers and snowboarders. That’s a great point because airboarding would potentially go faster then snowboarders and if the slopes decide to share the same course as skiers and snowboarders then there could be a problem. I believe airboarders will get their own area so that’s some good news. Comparing an airboard to a bodyboard that you use in the summer is the best people can come up with? Sure you use your body to control the tube, but wouldn’t you rather compare it to a sled? Instead of sitting on it you lie on it and you go much faster. Body boarding you lie on it but you’re just gliding the waves. Airboards have a triangular tip that allows you to control them if you’re heading into a dangerous area. Airboards are very soft, unlike regular bodyboards which are hard and in my opinion causes irritation. 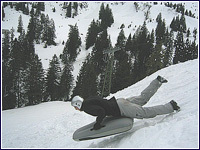 Once airboards are introduced to the USA as a major snow activity, many companies might create custom made boards that will fit your body structure perfect. So getting the facts straight, gliding down a steep hill at 60 miles an hour with nothing but snow in front of you sounds intriguing, but why are adults avoiding this? Children that are starting to love this activity will eventually get adults involved say certain press, and if adults get involved, you know it’s going to be a very popular activity. There are a couple boards already available to the public, one being a kid’s size that can handle up to 85 pounds of weight and an older child’s board that can handle around 150 pounds, they both retail for under $300.00.